The Garmin Fenix 3 is my favorite piece of hiking gear, bar none. It’s like having an outdoors smartphone on my wrist, 24/7. The Fenix 3 has hundreds of features. Here’s what’s good, what’s not, and why you should get this awesome hiking watch. Note: There’s a newer model, the Fenix 5, and the review is here. I purchased the Fenix 3 on the day that came out (in March 2015), and have been using it every day since then. Being a hiker and a tech geek, I had a hard time deciding on which smartwatch to get. I considered getting the Apple Watch, Garmin Epix, Suunto Ambit, and I also considered doing without it. I was also conflicted after reading the numerous reviews on Amazon and REI. So I tried it out for myself. 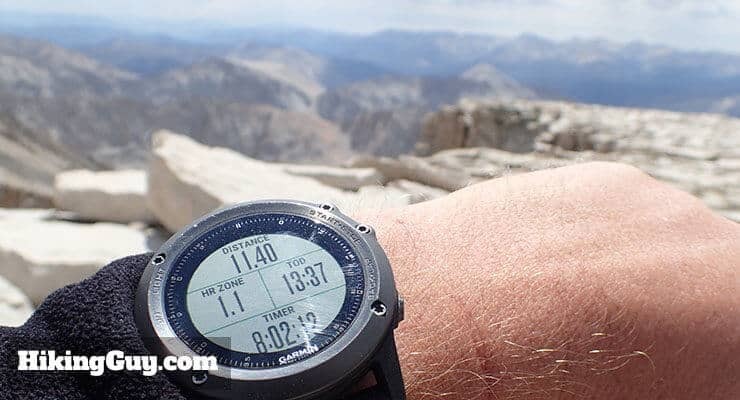 Using my Fenix 3 HR on the summit of Mt Whitney. The HR model has optical heart rate, making the watch not only a dashboard for my hike, but also for my body. Some watches and smartwatches are complicated and hard to use. This includes some models from Garmin. But the Fenix 3 is easy. The buttons on this watch are used consistently and make logical sense. After a minute or two using it, you’ll know how to work every screen. The keys on the Fenix 3 are simple and consistent. The face is easy to read. The colors and contrast are simple and effective. A backlight, triggered by a single button, is customizable. For example, you can turn the backlight on automatically when you hit any button, and it can stay on from 8 seconds to a minute. I use the Fenix 3 heavily for hiking, and I’ve found the GPS to be spot on. I did a test on a 1 mile stretch of road that had an official measurement. I compared it with my old 910xt, and GaiaGPS on my iPhone 6. I also did the test on a few stretches of local trails. The Fenix 3 always had the best GPS accuracy. The GPS fix is solid too. I never had a signal dropout in deep woods and trees, while friends with other watches and smartphones do. Garmin actively updates the firmware to address GPS accuracy, and it’s been effective. The coverage and accuracy seem to get better over time. A simple green colored message lets you know when GPS is locked in and an activity can begin. The Fenix 3 can not only use GPS satellites, but also the Russian equivalent called GLONASS. Sometimes it’s better with both, sometimes it’s not, but you have the option. Lastly, and perhaps most importantly, the Fenix 3 can get a GPS fix very quickly, generally within a few seconds. And it works quickly when you dramatically move locations too. For example, I used the watch in LA one day, flew to Turkey, and fired it up there. I had a GPS fix within a minute. Navigating with the Fenix 3 was an important feature for me. I considered getting a handheld GPS like the Garmin Oregon 750t, or even using my iPhone with a waterproof case. I said no to the Oregon because I didn’t want to be dependent on Garmin’s (expensive) maps. I said no to the iPhone case because I wanted better battery life. I also considered the Garmin Epix, which has a map screen, but it has a reputation for being buggy. I also noticed that a lot of retailers (such as REI) stopped selling it. Not a good sign. But I was worried that the small screen on the Fenix 3 wouldn’t be too helpful. It turns out that I don’t actually need the electronic maps to navigate. I just download the track of the route to the watch, and then use that to make sure that I’m on course. The track screen on the Fenix 3 shows your position relative to a track you’ve downloaded. You can see where I went off the track (black line) and the track I put on the device (green line). The unit can also vibrate and notify you when you are off the track. For example, a common use case is when I’m hiking and realize that I might not be on course. I bring up the track screen on the Fenix 3, and then see my position relative to the track. If I’m not on or close to the track line, I backtrack until I am, then look closely for signs on the trail. This system has worked really well for me. I have a full guide to creating hiking routes and transferring them to your Fenix 3 here. There are also third party apps like this one from my friend Rodrigo that let you put maps on the watch itself which you can give a try. There’s nothing more annoying than having to constantly charge a device, especially one that you use as a personal activity tracker. I used to love my FitBit, but grew tired of charging it all the time. The Fenix 3 doesn’t have that problem. I use it 24/7 as an activity and sleep tracker, I use it to track a workout for about 30-90 minutes a day, and I track one long (3-8 hour) hike a week. I also have the Bluetooth and WiFi always on. For all that use, I generally just charge it for about an hour or two (often just before my long hike, and then right after). The unit charges pretty quickly with a USB based cable. According to Garmin, the watch will work in GPS mode for about 16 hours. I’ve used it on overnight backpacking trips and it wasn’t a problem recording both day’s hikes in GPS mode. Lately I’ve been using the Fenix 3 HR model, and I can get about 12-13 hours of continuous use. By default, the Fenix 3 records a GPS fix every second in GPS mode. But if you need longer life (like on a multi-day backpacking trip), you can switch it to “smart recording” which will extend the battery life. There are also tons of USB chargers you can bring if you’re doing an extended backpacking trip that should cover you for two weeks of daily hiking. Also note that the HR model uses more battery than the non-HR model. Every screen and piece of data that you see on the watch can be personalized. The Fenix 3 has “data screens” that you see during hiking (or any other activity like running, biking, etc.). Each screen can show from 1 to 4 pieces of data. And each activity (like hiking) can have from 1 to 12 different screens. You simply press the up and down button to cycle through each screen. It lets you see what’s important to you and hide what’s not. I customized the hiking screens to show only the data that I need. The customization goes just beyond hiking. You can choose your watch face. You can choose what pieces of information you cycle through, such as altimeter, barometer, steps, weather, compass, and temperature. The screens also include Bluetooth notifications from your phone. For example, your smartphone can get the weather and output it to your phone. Garmin calls these screens “widgets” and has opened it up to developers as part of it’s “Connect IQ” app marketplace. So if you don’t like the default weather widget, you can download the Accuweather widget. Same thing goes for watch faces, data fields, and apps. I go with a watch face that has the current moon cycle and sunset, in addition to the time and date. Examples of free customization options for the Garmin Fenix 3. And then there are apps. Think of apps as activities. Hiking is an app. Running is an app. And there are apps for almost every activity, from rock climbing, to biking, to walking, indoor running, almost everything. Apps are also free on the Fenix 3 Connect IQ website. You can basically make this watch do anything you want. And if you don’t want to customize it, it just works out of the box as well. I found that as I used it more, I got more adventurous and tried more customization. Keeping an eye on my heart rate as I hike up a climb in Angeles National Forest. I like that I can monitor my fitness stats and my hike stats in one place. The Fenix 3 is much more than just a hiking GPS. I thought I would just use this for hiking, but I literally use it every hour of every day now. To start, it’s a fitness tracker. I leave it on my arm and it tracks my steps, and it tracks my sleep. And it doesn’t look like a fitness tracker (aka home arrest bracelet). It looks like a rugged watch. I wear it at work, I wear it at play. Hanging with my Fenix 3 on vacation in Rome. The step monitor helps me make sure I stay active every day. It even has a move alert. If you’re at your desk to long, it’ll buzz and remind you to move. The sleep monitor tells you how much sleep you get – how much is deep, light, or awake. It’s automatic. No buttons to press. The Garmin app and website allows you to see how many steps you take on a daily, weekly, and monthly basis. Garmin Connect sleep report from Fenix 3. If you do any other sports or activities, the Fenix 3 works for those too. I use it for my mountain biking and road biking as well. A simple handlebar mount lets me attach the Fenix 3 and it becomes my cycle computer. I opted in for an easy to mount speed and cadence monitor too, and now I can get all the stats from my rides. Fenix 3 mounted on my bike. I can customize the screens and data for my rides on the watch too. Likewise, I also run occasionally. I purchased the chest heart rate strap. The cool thing about this heart rate monitor is that I can measure all my stride stats too. I’ve used these stats to increase my running cadence and create a more efficient stride. The heart rate monitor also allows the Fenix 3 to estimate my VO2 max (an indicator of fitness) and recommend recovery times after each workout. It’s pretty amazing. If you’re into fitness and want to connect, feel free to follow me on Strava or connect on Garmin Connect. The heart rate monitor is also usable when hiking. I’ve found that it gives me a much more accurate estimate of how many calories I burn during a hike (compared to a non-heart rate estimate). This helps me make sure that I’m eating enough on long hikes to keep my energy levels topped up. Heart rate data from a long hike with the Fenix 3. Lastly, worth a mention, are Bluetooth notifications. The watch can get notifications from your smartphone. For example, if you get a phone call, the watch can vibrate. This can get pretty annoying, so I recommend shutting off any notifications on your phone that are not critical. I get a notification when I have a call or text from family or friends. Email and other crap doesn’t come through. But in this way it works just like the Apple Watch. You can get the Fenix 3 with a regular band (in plastic or leather), or with the high-end all-metal links on the Sapphire model. The Sapphire model is supposed to be more scratch resistant, but the band needs to be customized by you to be the right width for your wrist. I recommend taking it to a jeweler or using this simple and cheap link tool to pop the links out. And the Sapphire band doesn’t fully open, so if you want to use it on a bike, you have to change the band. Luckily the Sapphire edition includes a rubber watch band you can swap out. I have the Sapphire band in reserve in case I need something fancy. Personally I think the leather banded Sapphire model is a good balance between ease and style. Comparison of Fenix 3 models and styles. I don’t know about the scratch resistance of the regular model (I have the Sapphire), but after doing research, it looks like you should get the Sapphire model to avoid scratching. There’s no getting around it, it’s an expensive piece of gear. When you compare it against a nice watch, it’s cheap though. When you compare it against the value you get from an Apple Watch, it’s worth it. The Apple Watch is a decent alternative, but it’s only water resistant. And it needs your phone to work. The Fenix 3 works on it’s own, and it’s waterproof to 100 meters. The bottom line is that the Fenix 3 is made for hiking and the outdoors, while most other models are not. In retrospect, if I ask myself was it worth the money, I can confidently say “yes.” I literally use it every day, it gives me feedback on my life and health, and I navigate with it hiking. It does a lot for the money. Garmin can do much better on the software front. 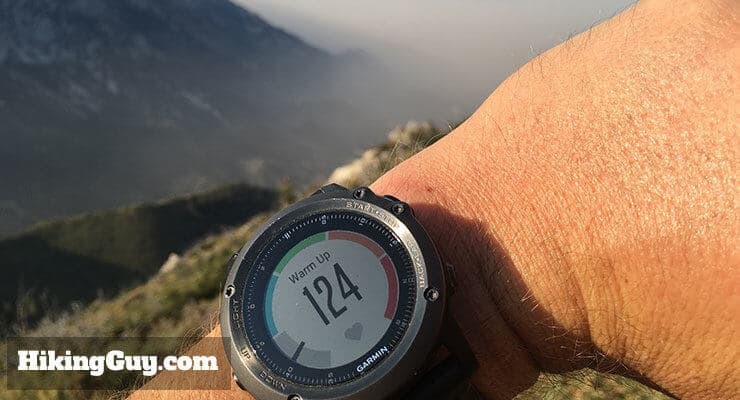 Reviewing the Garmin software for the Fenix 3 would be an article on it’s own, but here’s the good and bad of what you need to know. Overall, the software works and shows you information about your hike, sleep, etc. You can use it on the web or mobile. They change their mobile software quite a bit, and it’s not always for the better. Fitbit does a much better job. I hope they improve the software..
Fitbit has a simple way that you can see how many steps you have in relation to your friends. Garmin makes the process clunky and it’s not worth the effort. Your activities sync seamlessly to the device and web using WiFi or Bluetooth. Updating the firmware sometimes is a hassle. Often I update the Fenix 3 firmware with the USB connection, and then get prompted to update it to the same version multiple times. I don’t know why Garmin can’t get this right. It seems to be working much better now that it did when the watch first came out. On a positive note, Garmin updates the Fenix 3 firmware often and seems committed to improving the product and experience. One of the latest updates added tons of features, like SUP tracking, lactate threshold testing, stress tests, and golf tracking. The Garmin Fenix 3 firmware release page tells you what’s in each new release of the firmware for the watch. Garmin Express will update it automatically for you, or you can visit a site like DC Rainmaker. He has regular weekly recaps and mentions all the gear that has firmware updates. If you’re feeling adventurous, you can install a beta version of the newest firmware. It’s not officially supported, so I don’t do it, but I enjoy looking at the page to see what I can (potentially) expect in a new stable release. Sometimes the software has problems or issues. Garmin is usually good about fixing those. When things don’t seem right after an update, I visit this great Facebook group for the Fenix 3. Generally people are talking about whatever issue might be occurring already. It’s also a great place to ask questions. The Fenix 3 is a powerful tool. It’s expensive, but it’s worth it. Every person that I’ve met who has one loves it, and they end up loving it more as time goes on. That includes some grumpy old men I know who typically would not feel that way. If you don’t want to spend the money, I’d recommend figuring out a way to use your smartphone. If you’re considering the Fenix 3 against other smartwatches, I’d pick the Fenix 3 without hesitation.